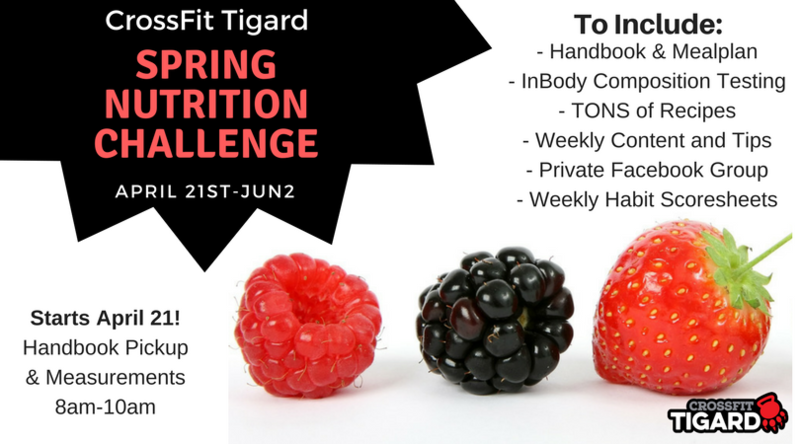 Spring Nutrition Challenge - CrossFit Tigard P.A.W. Lose Bodyfat This Spring with our Spring Nutrition Challenge! 6 Week Meal Plan — Take the guess work out of what to eat by following our 6-week meal plan-complete with grocery lists, recipes, and more great info. Before/After Measurements — Precisely measure your changes in bodyfat and muscle mass with before/after InBody Boy Composition Measures.